Good assessment skills (along with accurate vital signs) are what critical thinking, diagnosis, and treatment are based on! Without the fundamental building blocks, clues are missed and can send the rest of our diagnostics and treatments fumbling in the wrong direction. 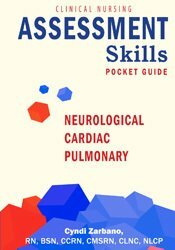 This full-color pocket guide provides portable, quick access to essential reference information on Neurological, Cardiac and Pulmonary Assessments. Filled with descriptive images, this thorough clinical guide will become your go-to reference for effective physical assessments.